Minnesota Music College Closes Abruptly, And Students Scramble To Find Schools : The Two-Way Some students of the McNally Smith College of Music graduated Saturday; others who were left short are rushing to find a new school — and learn whether their credits will transfer. McNally Smith College of Music is closing at the end of its current semester, in a move that was announced via email. Finals week brought a rude surprise to students and staff at the McNally Smith College of Music in Minnesota, as the school announced it was closing abruptly — and that it wouldn't be able to meet its last payroll. Some students graduated Saturday; others are frantically looking for options. The closure is being forced by financial problems and dwindling enrollment, board chair Jack McNally said in an email cited by member station MPR. The last official day at the school in St. Paul will come when the semester ends on Wednesday, MPR says. The music school's website makes no mention of its pending closure; nearly all of its social media platforms also omit that information. As of Tuesday, its Twitter feed included only an oblique mention, in a retweet of an offer of free memberships in the Minnesota Music Coalition for any students of the closing school. "The email asked faculty and staff to 'consider finishing the term and issue grades as usual' to ensure that students scheduled to graduate are able to do so, and that other students receive credits for the current semester.
" 'We fully understand the awkwardness and unfairness of this request,' McNally wrote, asking staff who choose not to continue to notify a supervisor." In a separate email, school president Harry Chalmers said that the school had been trying to become a nonprofit for nearly two years but that it hadn't been able to complete the task. "We sincerely wish you all the best and are deeply sorry for this highly disappointing situation for all of us," Chalmers wrote. The school's Facebook page makes no overt mention of the closure — except in a slew of new reviews and comments in which students, their parents and staff members have been venting their frustrations and commiserating. "I was 3 credits away from graduating and they decided to just close with absolutely no notice. I've always had issues with different departments not communicating properly but this is just ridiculous. I highly doubt I will be able to transfer all of these credits to take a single class that was only offered at this school. I'm going to be forced to start almost from scratch." "My daughter is a McNally student and she is absolutely heartbroken. As a parent, I am worried about her and her future, but I am also angry that McNally asked that we prepay next semester's tuition (which we did). They certainly knew that this was coming. I think it was unethical to ask for payment. McNally was not answering their phones today and I do not expect to get a reply to my emails. I have been advised to contact the Minnesota attorney general." At Saturday's graduation ceremony, MPR spoke to students who are just a handful of credits away from their degrees. Some worried about food with the meal plan left in question. An international contingent, who came to the U.S. to study at McNally Smith, worried about their education visas expiring — and whether they would be allowed to return after the holiday break. "We had flights booked, all of us, we had flights booked for the holidays," Andrea Fonseca of Costa Rica told MPR. "We all wanted to go see our families and their friends. And the international representative of the school said she's afraid that we go on those planes because we're probably not going to get let back in." 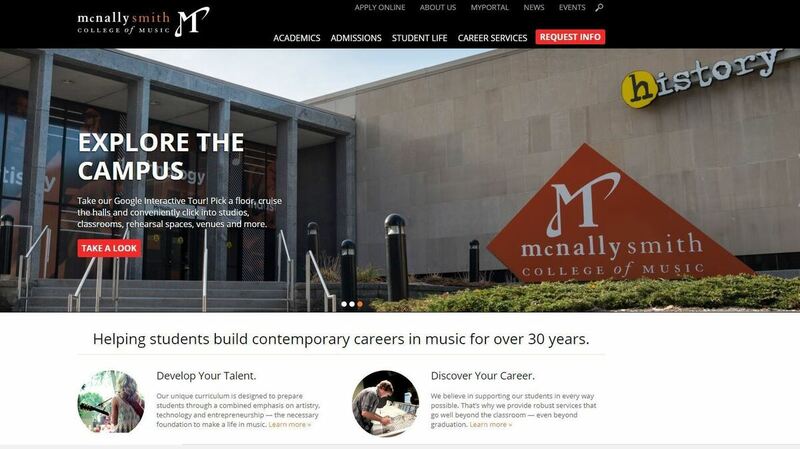 On its website, McNally Smith calls itself the "Midwest's premier contemporary music college, offering degrees in Performance, Business, Production, Composition, Songwriting, Audio Engineering & Live Sound." As for its accreditation, the school says it is "institutionally and programmatically accredited by the National Association of Schools of Music (NASM)" and is registered with the Minnesota Office of Higher Education — but it also warns, "Credits earned at the institution may not transfer to all other institutions."